DevOps cuts deep and wide through industries, company sizes, and technology environments. Yet, DevOps is never done — it’s about continual learning and improvement rather than an end state. Puppet is here to help. We draw on the success stories and lessons learned at organizations that are already driving improved performance and better business outcomes with their DevOps initiatives. 1. Build the business case for DevOps. 2. Address the biggest challenges to DevOps success. 3. 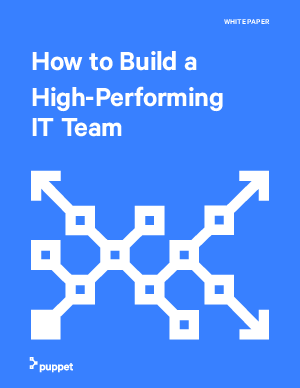 Develop a performance-driven team structure. 4. Choose the right Tools and processes. 5. Plan your key implementation phases.